An injury in upper extremity or elbow can be treated with the skilled services of a physical therapist. If your doctor approves, perform certain at-home stretching exercises to increase arm strength and reduce stiffness in the elbow joint. Performing stretching exercises helps regain normal range of motion (ROM) and strength of arm. Hold a tennis ball or a squeezy ball in the hand of your arm with a stiff elbow. Bend your elbow and gently squeeze the ball in your hand with your fingers and then release. Each time you squeeze the ball, you should feel a stretch in your fingers, elbow and forearm. Repeat this for 20 times, three times a day. To reduce stiffness in your elbow and strengthen the supinator and pronator muscles, which makes wrist movements. Hold an object or weight dumbbell of 1 pound in your hands, which is injured, with the thumb pointing up towards the ceiling. Twist your wrist as far as you can to the right, and hold the position for 2 seconds. After that, twist your wrist to the left, as far as you can, and hold for 2seconds. Repeat this movement up to 50 times on each side. Hold a hand weight in your injured hand, and rest your forearm on a sturdy surface with your palm facing up towards the ceiling. With the help of your wrist, lift up your hand off the surface and try to bring the weight towards you. Hold this position for 2 seconds, release your hand, and then lower your wrist back down to the surface. Repeat this movement 3 times, five times a day. Pinch your fingers together by bringing all five fingertips in contact. Just below the base of the fingernails, put a thick rubber band over your fingers. Expand your fingertips until you feel a stretch in the muscles of your arm and elbow. Bring fingertips back together, and then expand again for about 25 times. Repeat this movement three times a day. To strengthen the bicep muscles. 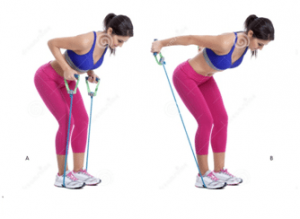 Take a resistance band and hold one end of the band with the injured hand, and anchor the other near the floor. Support the injured hand with the other hand at the back, as you bend the elbow against the resistance of the band, before slowly returning the arm to the starting position. Repeat this movement 15 times, three times in a day. Place the centre of the band under your feet and hold one end in each hand. Start with the arms behind your head& elbows bent, pointing to the ceiling. Straighten the arm overhead in a controlled manner until you feel a stretch in your arm muscles. Bring back the arm to the starting position and repeat it 10 times, thrice a day. Stand with one end of the band under the feet and the other end in one hand. Lean forwards at the hip, keeping the back straight. Start with the arm bent at the elbow, wrist at chest level. Straighten the arm out behind you until you feel a stretch in your arm muscles. Bring back the arm to the start position and repeat it 10 times thrice a day. Do not rest for more than a few days in case of injury. Start with some gentle exercises. Do simple exercises to restore range of movement, promote strength, ease stiffness and help get your elbow back to normal. Do apply heat packs or ice packs to get relief from pain for 10-15 minutes twice or thrice a day. Make sure you don’t apply them directly on the skin to avoid burning or irritating your skin. Do visit a physiotherapist to know the real cause of pain. Do not continue the activities which lead to the injury until you recover.